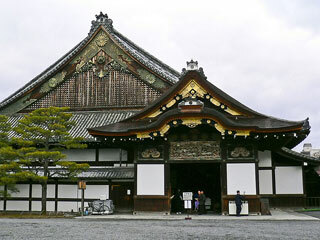 Nijo Castle is a flatland castle in Kyoto, Japan. The castle consists of two concentric rings (Kuruwa) of fortifications, the Ninomaru Palace, the ruins of the Honmaru Palace, various support buildings and several gardens. The surface area of the castle is 275,000 square meters, of which 8000 square meters is occupied by buildings. This article uses material from the Wikipedia article "Nijo Castle", which is released under the Creative Commons Attribution-Share-Alike 3.0 License.